Not a lot seems to change at SME’s HQ in the picturesque town of Steyning, West Sussex. Men in white coats have been building high quality turntables and arms there for so long that several generations of local engineers have toiled at the machinery. So the sale of the company to the Cadence Group last autumn must have sent shockwaves through a company that has been in private ownership since the 1950s. But things are looking a lot more positive now; the new owners have brought in aerospace engineer Stuart McNeilis as CEO and he has already refurbished the paint shop and plans to increase the workforce in anticipation of burgeoning future demand. In the past, SME gave the impression of patiently waiting for the business to come to it – it had, after all, established a reputation for making the finest quality arms and turntables in the business. But there’s no doubt that appointing a UK distributor and encouraging international partners will likely increase sales for the company. It is encouraging to note that McNeilis intends to bring in design as well as engineering skills, so that SME can continue to expand and refine its range. With the death of founder Alistair Robertson-Aikman (ARA) in 2006 the company was left without a real turntable enthusiast at the helm, so some input on the R&D front will presumably be welcomed. 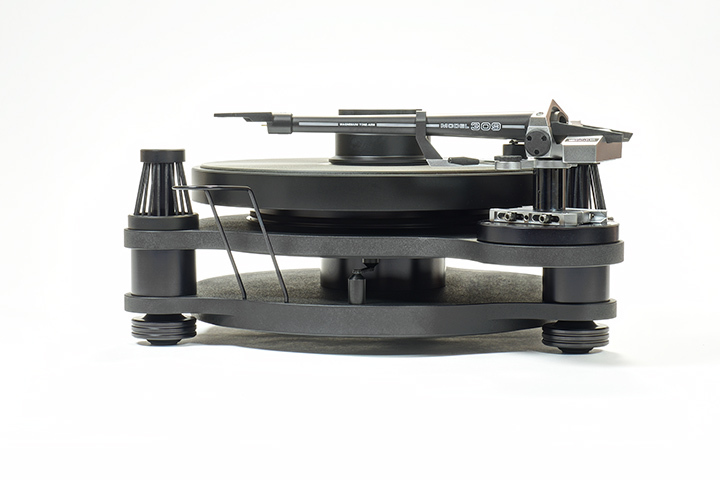 The last product to be developed prior to this change of ownership was the Model 15 turntable, which was the first totally new turntable from the brand since the Model 10 in 1999. The earlier Model 20 and 30 have been refined to their third and second generations respectively as well as growing in girth with what ARA called the “long wheelbase” treatment (that is provision for a 12inch arm) in that time, but new models are pretty rare. The Model 15 was initially intended to be a more grown up version of the Model 10, but ended up rather closer to the rather more substantial Model 20. It takes its high-mass platter from the 20/2 (which is smaller than that on the current 20/3) and has suspension towers that are very close to those on the 20/3 but 8mm shorter. Each tower supports the plinth and platter on 10 rubber ‘O’ rings, a weight of 11 kilos being suspended on 30 rings altogether. The towers are adjustable in height and set-up involves using the supplied spacer to set the correct gap between the subchassis and plinth. The spacer alone says a lot about SME: all it needs to be is the right thickness, it could be made of plastic, but not only is it precision made in aluminium and engraved with a part number, but this small block is finished to the same standard as the turntable and arm. Which makes it less surprising when you learn that SME makes its own nuts and bolts. The Model 15 actually feels bulkier than its 11kg weight suggests. It’s a lot easier to move with the platter removed, for example. Despite being made of aluminium, the two slabs that form the bulk of the turntable are very thick, the lower one being the heaviest. Each suspension tower has a damped piston within it and the main bearing under the platter is likewise controlled in order to keep resonance at bay. It’s a suspended design but not a springy one like a Linn LP12, rather it’s a high mass system of a kind that is unusual even in the widely varying world of turntable design. Set up is a case of removing two bolts from the sub platter and winding another four up into the sub platter, SME clearly doesn’t want this part moving in transit. Fit the belt and carefully place the platter over the spindle, its top surface is softer than it looks and easy to mark.